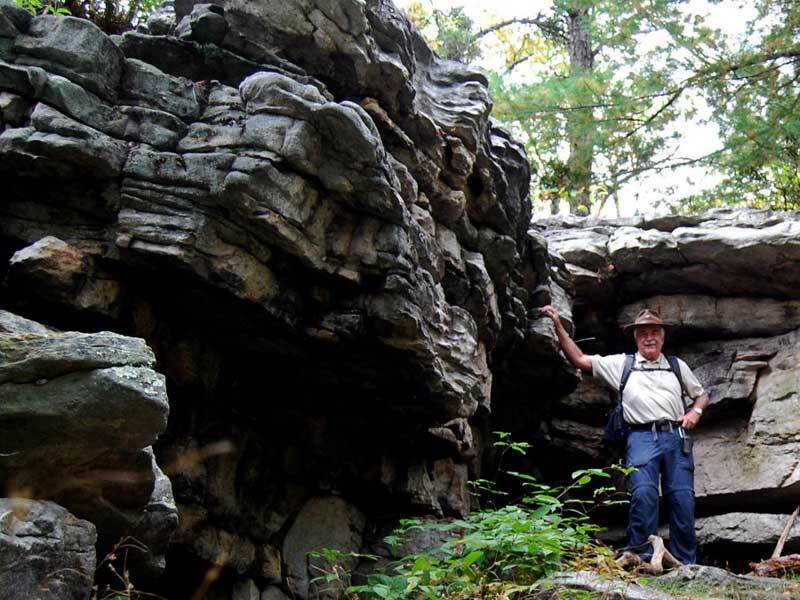 Big Schloss is another treasure in the George Washington National Forest. Relatively easy at only 4.4 miles and 1,000 vertical feet, it's the sister hike to Tibbet Knob which heads to the south from the same parking location. 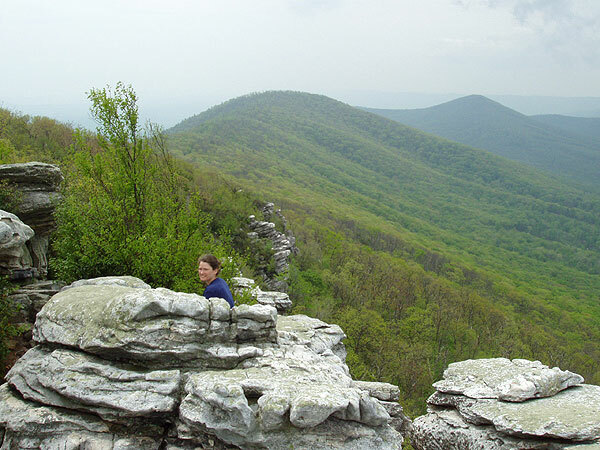 Tibbet Knob has two short rock scrabbles, but a 10th of the hikers, and just as good views. Big Schloss peak, named by German immigrants provides a wonderful view of the surrounding valleys. 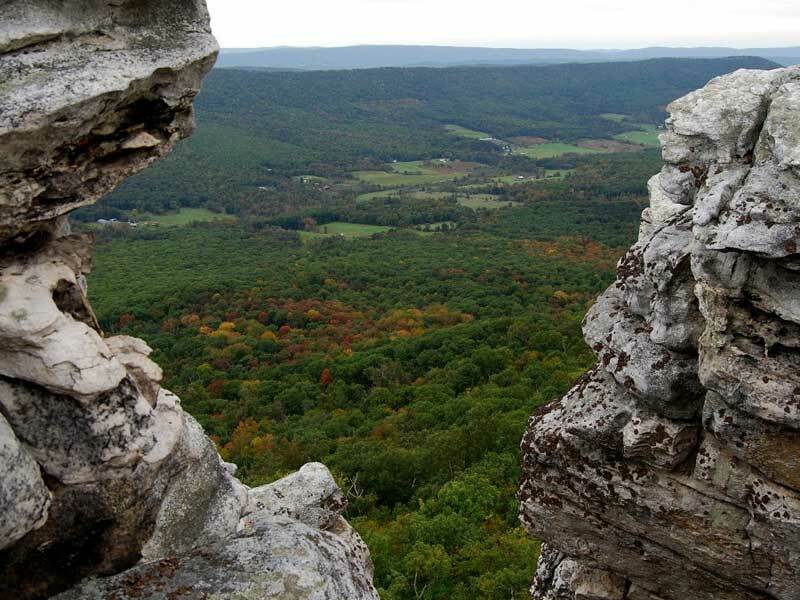 Make sure to bring a packed lunch because you will want to linger at the Big Schloss rock outcropping and soak in the view. 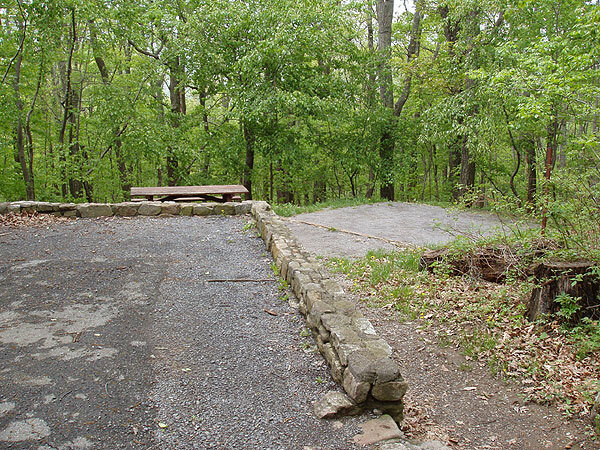 If you want to make a weekend out of it, the Wolf Gap recreation area has 9 well maintained campsites with bathroom facilities. 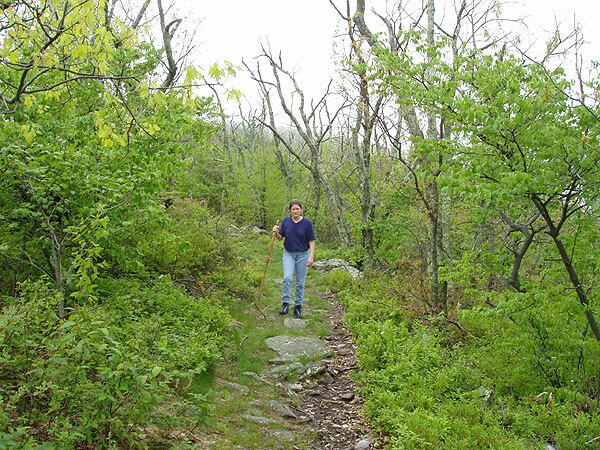 If you have some extra hiking time consider hiking the Tibbet Knob route as well. The views are every bit as good. Mile 0.0 - Leave the Wolf Gap Campground (near campsite #9) and start up the orange blazed Mill Mountain Trail to begin the steepest portion of the hike. 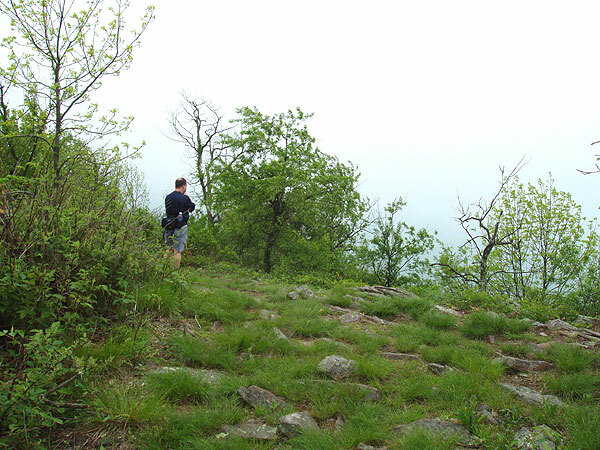 The first mile has several switch backs before arriving at the ridge line of Mill Mountain. 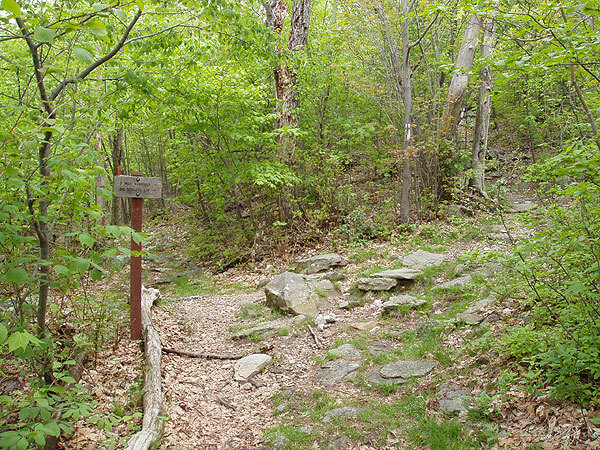 Once getting to the ridge line, turn left and continue following the now narrower trail as it follows the ridge before arriving at the junction of the Big Schloss Trail in 1.9 miles. 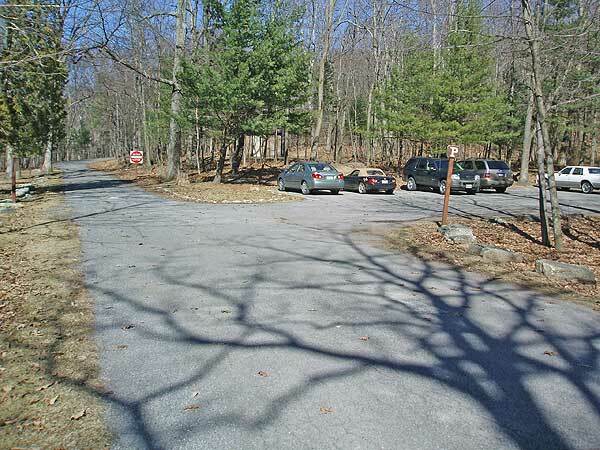 Turn right onto the white blazed Big Schloss Trail for another 0.3 miles before crossing a wooden bridge that will take you to the overlook just 50 yards further along. Enjoy the view it's one of the best! 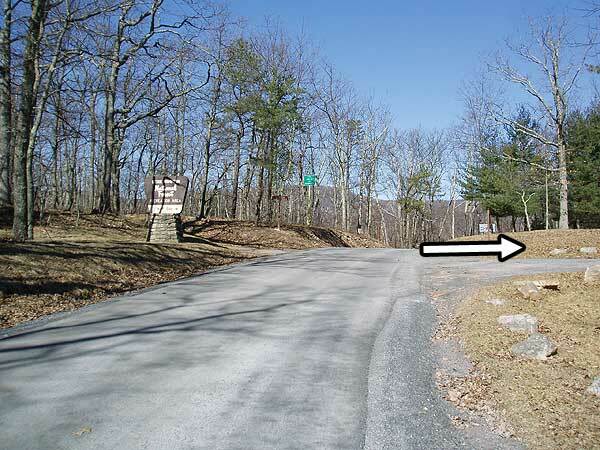 To return, just retrace your route back to the Wolf gap Campground. 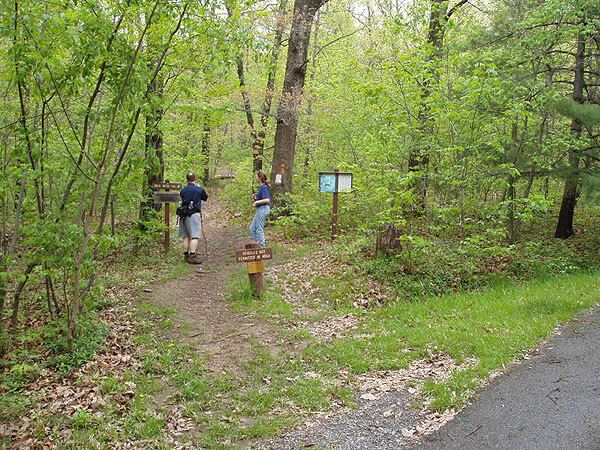 This is a very pretty hike, and the camping available at the recreational area is very nice. My group and I found great difficulty in the initial 800 ft climb to the first overlook. The grade in some places felt almost as steep as 45 degrees. After the initial climb, the trail just wandered along the ridge, and we reached Big Schloss for good break to take in the views. THIS IS MY FAVORITE LOCAL HIKE (I live in Winchester)!!! It's amazing in the summer and fall. 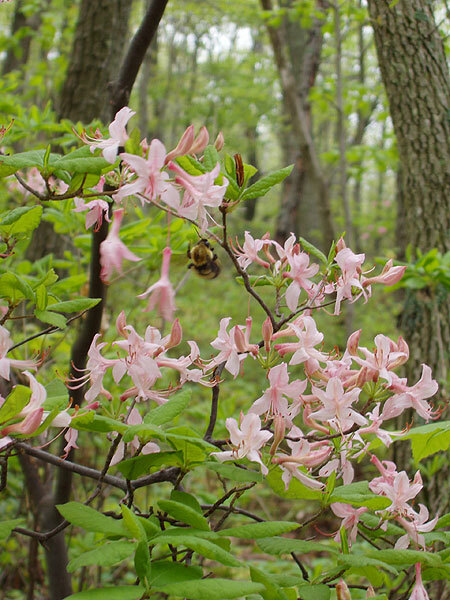 We just went in April and it was still beautiful but there was not much foliage. The great thing about that was that you could see even farther into the distance, but I prefer the greenery. The best time to go would be between July-October for the summer or fall views. New Years day hike. 10 degrees at the trailhead, who knows up top. I solo'ed this time expecting to see no one but I saw 2 more solos and 2 couples. The snow was under 1 inch so there was no trouble hiking. Great day hike. it took me 1 hour up and 50 min back. One of my favorites! 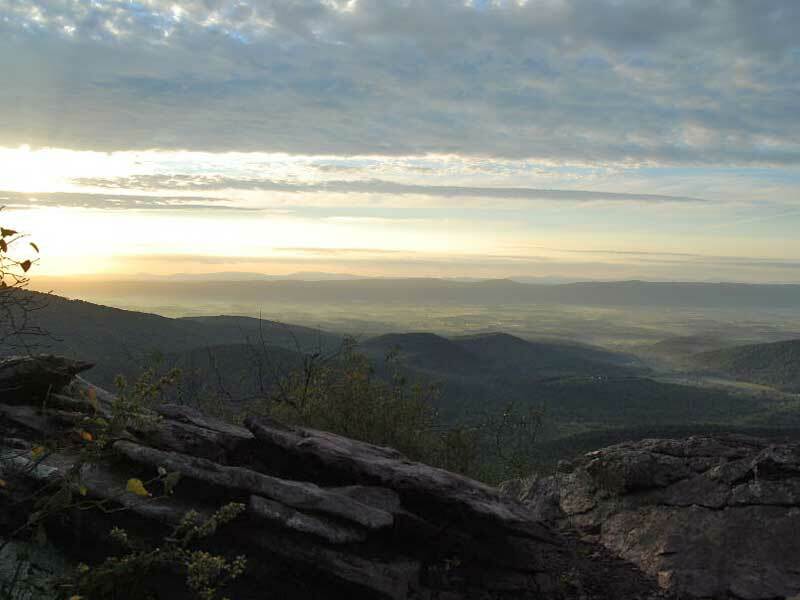 I would highly recommend this hike for someone looking for easy to moderate 4 mile hike. We hiked this one on this past Sunday afternoon and the trail was mostly empty for most of the hike, We did meet a few other people at the summit. So if you looking for peaceful empty trail , this is the one and the views from the top are incredible. Started around 2:30 and were back to the parking lot at 5:30 after spending quite a good amount at the top. This is a fantastic hike! 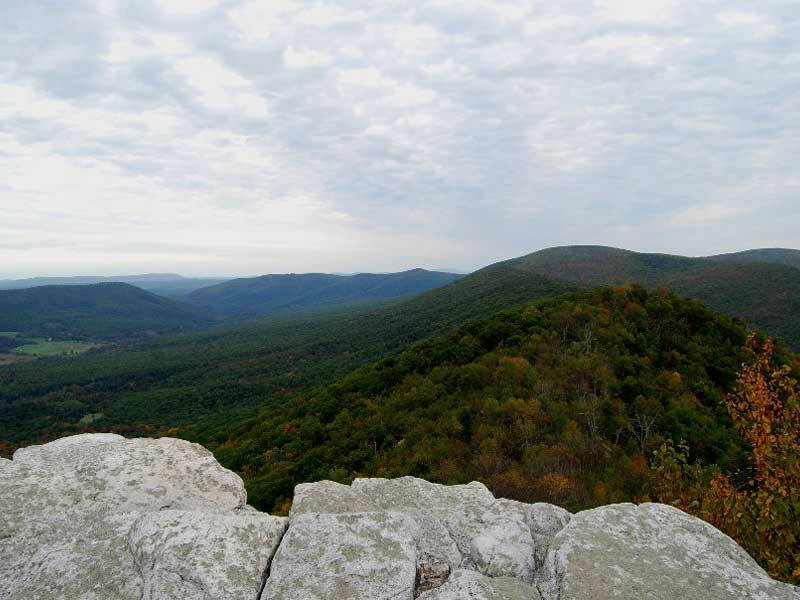 Starts out with a moderate climb, followed by a mostly level breathtaking walk along the ridge. Along the ridge you have a clear view towards the south east almost the whole time. There are many points were you can sit and enjoy the view in relative solitude even though the trail is popular. The bridge and the cliffs at the summit are really striking, and provide dramatic views to the north west. This a really great climax to the trail. 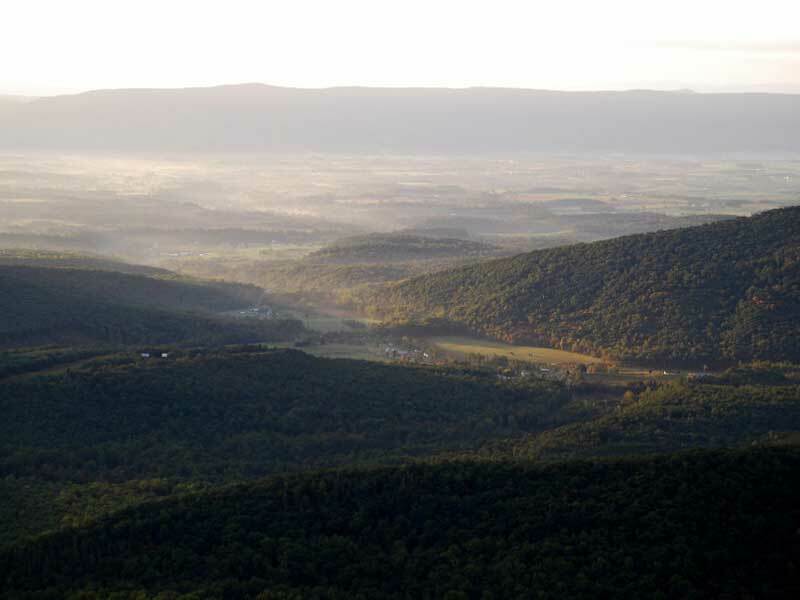 I've hiked most of the Shenandoah trails on here and this is in my top three. Very surprised that it only scored a 5 in the view category. 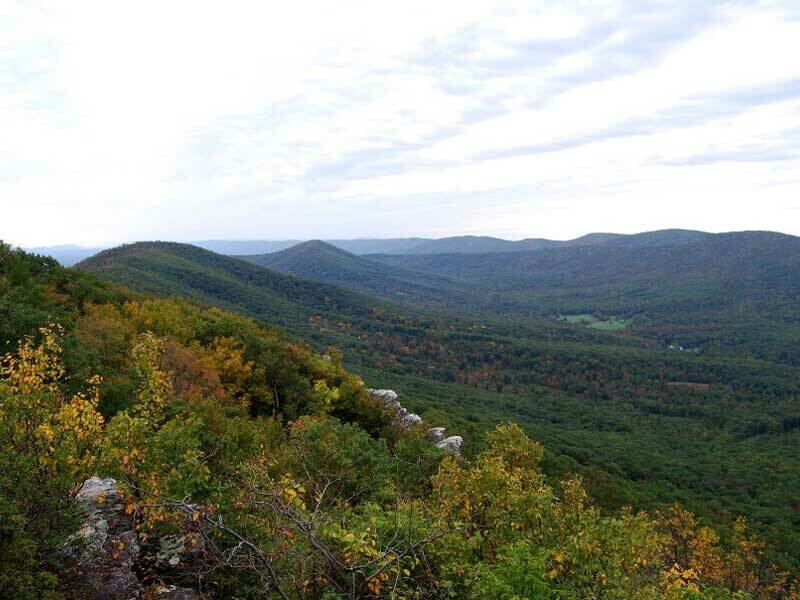 This hike has better views than Sky Meadows and you can see them for a much greater percent of the hike. I can't wait to do Big Schloss again, I'm going to try it in all the seasons. 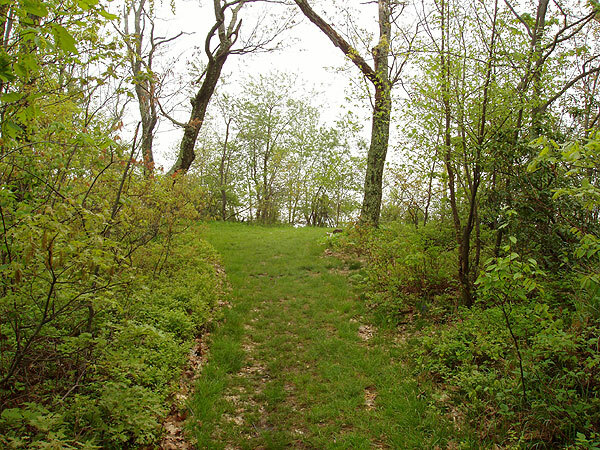 I did Tibbet Knob as, which was a great little hike. If you arrive early enough you could probably do both in the same day. Early April - Photos - Courtesy of Julie A. Late September - Photos courtesy of Tom H.